I have purchased a Fujitsu server. I have 6 HDD 2TB and created RAID-6. I need to install Windows Server 2012R2. 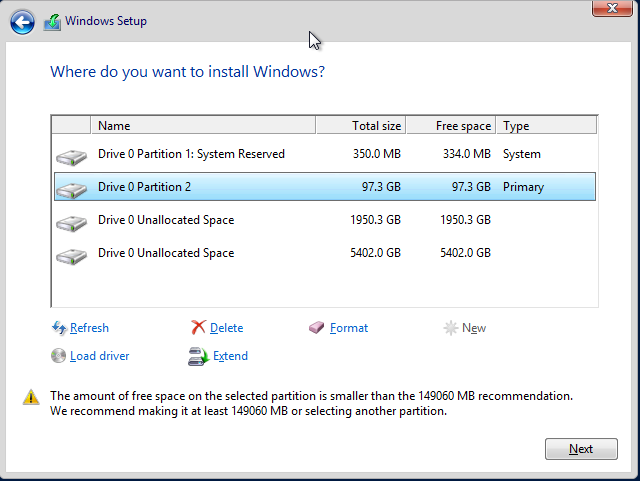 During installation I created 100GB partition for system, and then windows setup split rest of free space to two unallocated free space. I need that space all for one partition. Are there some restrictions to size of partition or am I doing do something wrong? Just to clarify, RAID-x does not, inherently, impose *any* size limits on the array. That's not to say that the controllers can't access individual drives beyond a certain size which therefore imposes a controller limit on the size of the array. The file system, however, can (and does) impose a size limit on the logical drive volume. Partitions are bad. create RAID VOLUMES. Store you VMs on a separate volume from the host os. The author acknowledged that changing bios to UEFI resolved the problem.